Call Heath (205) 620-1818 Birmingham AL. Our customer in Shelby, Alabama had difficulty maintaining his lake property due to dramatic slope in back yard. Dirtworks was able to solve his dilemma by creating multiple levels of retaining walls. Now our customer can enjoy his usable yard, professional landscape and relaxing lake view. Upon completion of this project, our customer desired additional hardscapes in front of his property. We removed an existing concrete driveway and installed an attractive paver driveway. 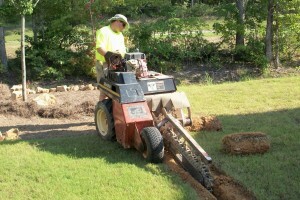 For any hardscapes, retaining walls or landscaping ideas, call Heath (205) 620-1818.